I love Meringues. But not the hard kind. I like meringue to be crispy on the outside and soft and chewy on the inside. This is the type of dessert that can be made at the last minute. Bakes in less than 20 minutes and once it has cooled it can be filled with your favourite filling. I like a whipped cream and strawberry filling, but lemon curd and whipped cream works for me too. Beat egg whites until soft peaks form. Slowly added the sugar and continue beating until the meringue is thick and shiny. TIP: To test rub a little bit of the meringue between two fingers. If you can still feel the grit of the sugar, keep beating. Cover a 10 X 15 cookie sheet with parchment. Spread the meringue evenly over parchment and bake in a 400°F oven for about 8 minutes. Meringue should be turning golden and the surface should be starting to crisp up. Turn the oven down to 325°F and bake for another 8 minutes. Meringue should still be soft in the centre. Remove from the oven and tip meringue on to a tea towel and peel away the parchment. Let cool for about 20 minutes. Spread with whipped cream, sprinkle sliced strawberries over the surface and roll. Don't worry if the meringue starts to crack a little. Just keep rolling. Transfer to a platter and sprinkle with powdered sugar. Whip the cream with the salt, sugar and vanilla until thick. 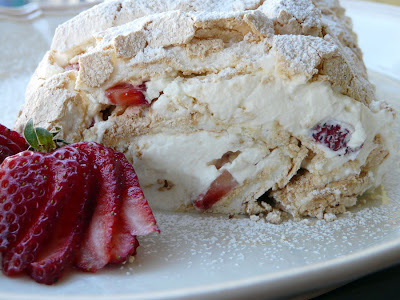 My husband loves anything with meringue and I love anything with strawberries. The previous post on the chicken pie looks delicious as well! 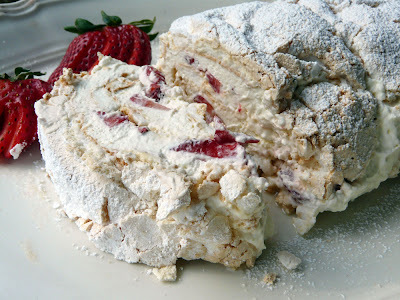 I love meringue, but I've never made a rolled meringue! This looks decadent. My next dessert!! This looks wonderful. I've never had a rolled meingue, this will be a new taste treat. I like the versatility of using seasonal fruits with this recipe. What a beautiful dessert and a very special way to use the lucious strawberries that will be in our markets soon. Love meringue! This is what makes your food photos so spectacular ~ I want to try EVERY single creation you so generously share with us. I love meringue, just as you do. I've been too intimidated to try and make one, but you've given me confidence to try this recipe-- especially since I live in an area that is known for their strawberries (Driscoll). I can see this on our dessert menu, very soon. Thanks...and your blog is beautiful. I have been quietly lurking here for some time. They burned in the first 8 minutes. Anonymous, that is unfortunate. Individual meringues are usually baked at a low temperature (275°) and for 50 to 60 minutes.